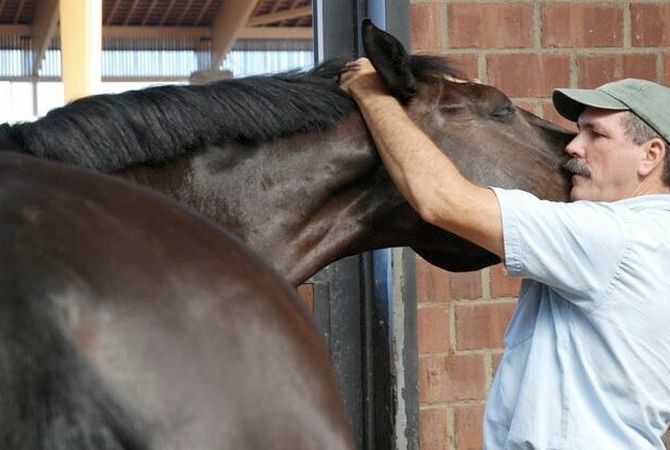 Mark Rashid is a horse trainer known for his ability to understand the horse’s point of view and solve difficult problems with communication rather than force. He began working with horses at age ten, when he met the “old man,” who taught him to work with horses, not against them, and to listen to what the horse is trying to say. Masterson teaches equine bodywork in which changes in the horse's behavior and relaxed movements enable the horse to release structural tension that may affect performance and behavior. Jim Masterson teaches a unique form of equine bodywork in which subtle changes in the horse’s behavior, and relaxed bodywork movements that stay underneath the horse’s natural bracing response are used to enable the horse to release deep structural tension that may be affecting performance and behavior. Both are internationally acclaimed clinicians known for working with, rather than on or against the horse. Both have long recognized that a large percentage of training, behavioral and performance-problems stem from physical discomfort or restrictions in the horse, and that pushing the horse through physical issues is not the answer. Join us between the dates of July 9th through July 13th at the Happy Dog Ranch in Littleton, Colorado for a combined clinic with horsemen Mark Rashid and Jim Masterson. Auditors are invited July 9th -13th to watch and listen as Mark and Jim work together with riders and their horses to help them with behavioral and performance-related problems. In the first riding phase of the clinic, Mark and Jim will work with the rider, evaluating the horse’s movement as it relates to problems the rider may be having with the horse, and/or what the rider would like to work on. Auditors will then be invited to watch and listen as Jim does a complete bodywork session on the horse, talking about what he is finding and how it might relate to what was observed in the horse during the first portion. In the second riding phase Jim and Mark will re-evaluate the horse, and Mark will work with the horse and rider. Nine horses will be involved in the clinic. Training and Biomechanics. Mind and Body. There's something here for everyone! Don't miss your chance to join us and learn from these two internationally acclaimed horsemen. Where: Happy Dog Ranch, 7811 W. Titan Road, Littleton, Colorado, 80125. Due to popular demand, riding slots are now full. Auditing is $50 per day and that includes all phases of Mark and Jim’s program starting Monday July 9th. Auditing Information: Bring a chair, water, hat, and food. If the weather is good, for the riding portion of the program, Mark Rashid, Jim Masterson and the rider will be in the outdoor arena. Each clinician will have a microphone, so everyone will be able to hear, and the auditors will be seated on a small rise for easy viewing. After the riding portion, Jim Masterson will be completing the bodywork session on each horse inside the indoor arena where people can group their chairs around him. For inclement weather we will use the Indoor arena for riding and Jim in the Barn where people can group around him.